Set of 4 Victorian Style fine porcelain side plates (7.5"). Team it up with our Cake Stands or a designer addition to your tableware. 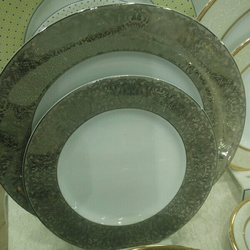 Its with attractive pattern and Elegant Design adds style to your kitchen and serving experience.Set of 4 Victorian Style fine porcelain side plates (7.5"). Team it up with our Cake Stands or a designer addition to your tableware. crockery is sometimes used for ceramic dishes. 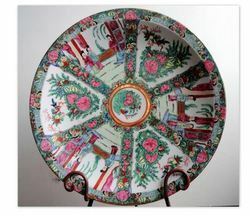 In the USA, ceramic dinnerware, whether made of porcelain or earthenware, is often referred to as china. Sets of dishes are often referred to as a table service or service set. Our gorgeous heirloom-quality porcelain plates, are perfect for commemorating occasions. Plates are not for use with food, and are not washable. Plate is shipped without the stand. Stand is shown for display purpose only. European Classics Home is an exclusive gallery featuring a selection of fine European style Period Furniture & Home Accessories. Bangalore, India. 'La Belle Fleur' by Fitz & Floyd. Porcelain, Japan. Set of 8 Luncheon Plates and 8 Mugs. We Are Manufacture A Best Quality Products In Low Rate In Market. Available in 10.5", 8.5", 7" & 6.5"
Also in Extra Large size of 12"